Have places for books throughout the house, like a basket in the living room and a shelf in the bedroom. Children are more attracted to a book if they can see its front cover, not just the spine. Keep a few books on the shelf at a time, facing outward, store the rest in a cupboard and rotate the available books (making sure to keep favourites out all the time). If all the books are on the shelf, he may take out all the books to find the one he is looking for. Always bring books to read in the waiting room before a visit to the doctor or dentist. Introduce some short stories, cause and effect stories, and books that describe a problem to overcome. 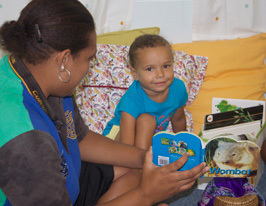 With your help, your child will learn to talk about books. Books can help prepare for an experience. For example, before the second child is born, read a book about the birth of a baby to your firstborn child. Choose age-appropriate content. At this age he is receptive to stories about fears and feelings. He can relate events in stories to his own experiences. Continue to avoid fairy tales and stories of make-believe. The real world is more than full enough now, and those favourites from your childhood can come later. By now he may recite words and phrases from favourite books. He can enjoy books about concepts like counting, opposites, and colours. A book can introduce new vocabulary, but don't let books substitute for experience. A visit to the zoo is better than reading a book about zoo animals. Continue to add new songs and poems. Sing every day, sing throughout the day, and sing slowly. When your toddler sings, he is making the words and sentences in his head long before the words start to come out. Continue to sing as long as he is enjoying the experience. The meaning and use of words comes quickly to a child who is sung to. He enjoys the feel and sound of his voice singing. 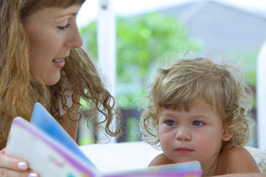 Read through children's books of poetry to find which poems your child responds to. Memorize them so that you can enjoy them with your child. He will show a lively interest in words. He will memorise the poems quickly and play with the words. Your child’s interests may guide your book choices. Ask questions about the pictures as you read. Expand the text and make it personal. ‘Do you remember when we saw the golden retriever on our walk?’ By introducing and repeating new words, you give your child many opportunities to learn them. Prolong these interactions and let your child take the lead. 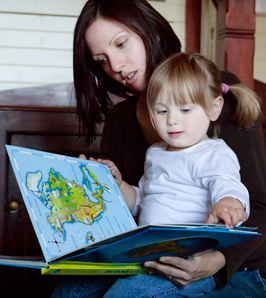 Continue to make reading and singing a part of your daily life with your child. Reading and singing songs together is just as much entertainment for a child as playing with a toy. You and your child’s life should be filled with songs and books that can be enjoyed together whenever there is a spare moment in the day.